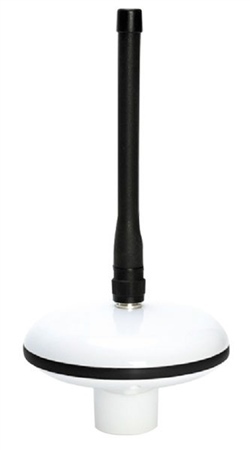 Perfect "all in one" AIS Smart Antenna solution for small boats, particularly RIBs, Sports boats and small yachts where dry space to mount black box AIS units is limited. Simply connect 12v or 24v power and the ANT200 will start transmitting data on all AIS targets within a 10 mile* radius of your boat. Ideal for use with existing AIS compatible chart plotters such as the latest Garmin, Raymarine, Navico, Standard Horizon and Furuno units. Connect the NMEA0183 (4800 baud) output of your GPS to the ANT200 and it will automatically multiplex (merge) the slower GPS data with the high speed AIS data and transmit everything on one high speed NMEA output (38,400 baud) - perfect for connection to a chart plotter with only one NMEA input. - Multiplexed NMEA input for single NMEA GPS+AIS data output at 38,400 baud - Simple to install "all in one" smart antenna solution - Integral 1" x 14 TPI thread for fixing to standard VHF mounts 15m Power/Data cable - High performance dual channel AIS receiver for use with existing plotter and radar systems - High Speed NMEA output (38,400 baud) * NOTE - In much the same way as hand held VHFs do not give you the range of fixed mount VHFs (no antenna ground plane), the ANT200 does not have the same range as the AIS200/400 black box AIS units. If maximum AIS range is your highest priority then one of the other Digital Yacht receivers should be used, but for small boats with the aerial mounted at deck level, 10 miles is a good range for AIS and the ANT200 is recommended.